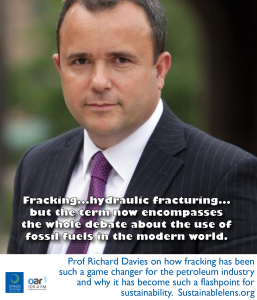 Professor Richard Davies on how fracking has been such a game changer for the petroleum industry, what are its costs and benefits, and why it has become such a flashpoint for sustainability. Professor Davies took up the post of Pro-Vice-Chancellor (Engagement & Internationalisation) at Newcastle University. He is a petroleum geologist, with a particular focus on hydraulic fracturing used to exploit shale gas and oil. Richard is an advisor to the All Party Parliamentary Group on Unconventional Oil and Gas. He tells us that he is agnostic about the issue of shale gas and oil exploitation but very outspoken about his commitment to expanding the evidence base in the European fracking debate. He is Project Lead of ReFINE. We ask Prof Davies if fracking is inherently damaging – either in its own right or for its implications for climate change, and why it has become a poster child for unsustainability. But first, we ask him about his own voyage of discovery, and what led him to train as a petroleum geologist. The reason we stop getting oil and gas will because it is so damaging or because it becomes so expensive to get hold of it that no one would pay for it. It may be that oil becomes a precious substance – no one would dream of burning it – that would be crazy…it would just be used for a select group of products or processes for which there is no alternative. Technology may unlock more oil reserves in the future, but the key question is do we really need to burn it? Perhaps we shouldn’t be burning it and using it for something else. Oil and gas companies are answerable to shareholders, and their shareholders are you and I. If we put the R&D spend in the oil and gas industry into other things such as energy storage…wow. We come from an agnostic, neutral perspective – we’re not for or against fracking – and therefore we’re unpopular with both sides of the debate…we’ve positioned ourselves just right, we’re neutral, we’re academics. The long term impact will be in looking after the bore holes…in 50 years time. There’s a huge debate about renewables versus fossil fuels and fracking is right in the centre of that debate. In a way, industry has made this all happen, but the questions haven’t been solved at the same rate the industry has been deployed. The questions have reached a bit of a crescendo, coming from all quarters, we have a handle on it, but we don’t know everything. I’ve learned a lot in the last four years…firstly admitting we don’t have all the answers, listening to people, I’ve never thought “that’s not a good question”. Of course its a good question, I’ve huge respect for people who get involved and ask questions. That’s forced us scientists to look at things, it’s forced industry to look as well, and I don’t think industry knew the answers to some of the questions members of the public were asking. Companies have got better at taking the public questions seriously, to research them and to provide good answers. We need a new breed of technical people who can see the world in a slightly different way. We need people to be open and frank and aware of more than their own little postage stamp piece of the puzzle. (Superpower) Think of the long term, not just the next five years. (Success) changing the law in the UK so companies not allowed to frack with 1km or the surface, therefore protecting people’s water supplies. (Advice) Keep asking good questions. Keeping the light shone on the fossil fuel industry will make for a better world. This was conversation was recorded at Newcastle University in September 2015. The Framing Fracking paper mentioned is here.